The Ministry of Road Transport and Highways has released data of the number of crashes and number of fatalities that have occurred in India in 2016. Here is what the list has to say about the top 10 cities and states with the highest accidents and fatalities. So, which is India’s most dangerous city for road users? 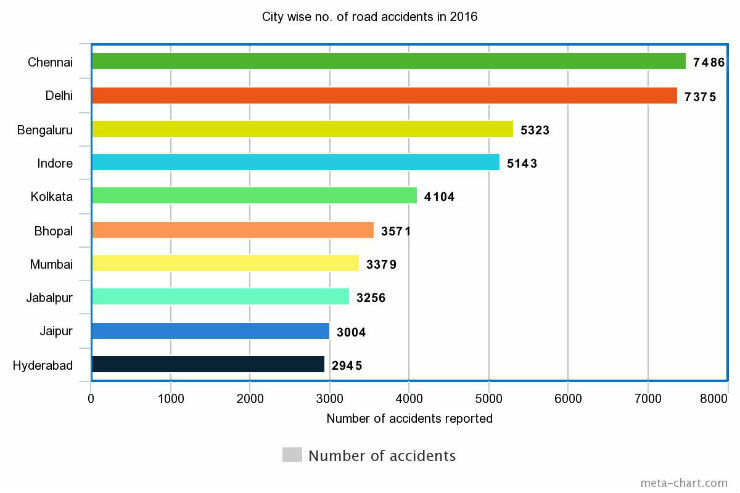 According to the figures, Chennai is the city that has the highest number of accidents recorded in 2016, which is really surprising. Chennai has 7,486 reported accidents. Delhi is really close, with 7,375 reported accidents. This makes Chennai the most dangerous city in India for the past year. Also, it is surprising to see a much smaller city like Indore in fourth position at 5,143 accidents behind Bengaluru, which comes third. Hyderabad is at the bottom of the top 10 with 2,945 accidents reported. 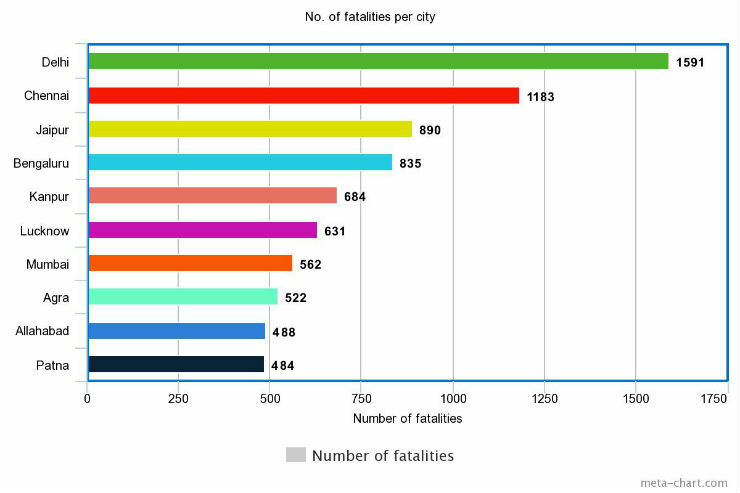 When it comes to fatalities, Delhi tops the list with 1591 people who died last year. Chennai is in a close second with 1183 deaths reported last year. A few surprising cities that were on the list were Kanpur at 5th position, Agra at 8th and Allahabad at 9th position. 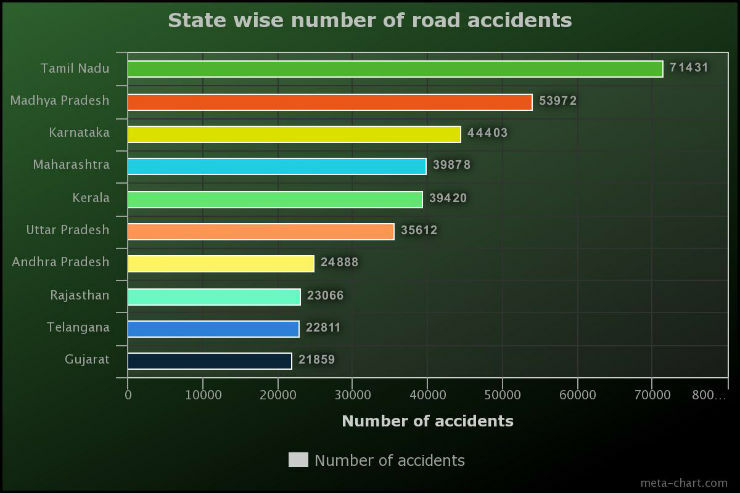 In terms of states, Tamil Nadu has the highest number of road accidents that were reported in 2016, at 71,431. Madhya Pradesh is in second place at 53,792 accidents that have been reported. Uttar Pradesh is 6th at 35,612, Andhra Pradesh is 7th at 24,888 followed by Rajasthan, Telangana and Gujarat. 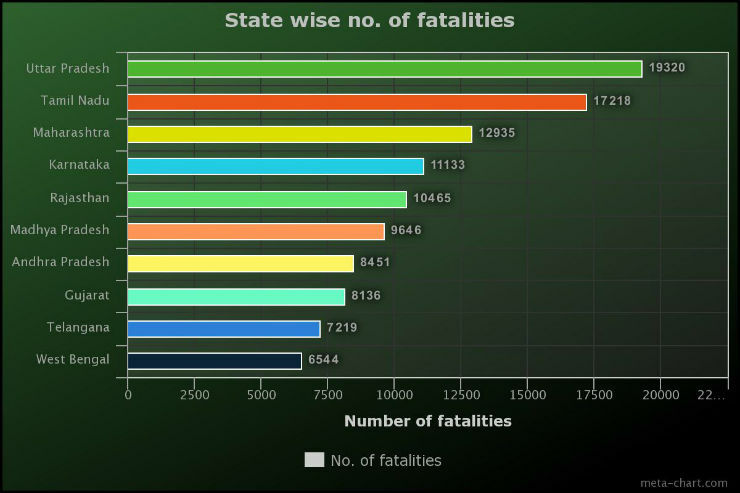 In terms of fatalities, Uttar Pradesh tops the list with 19,320 deaths followed by Tamil Nadu. Maharashtra is in third place, followed by Karnataka and Rajasthan. Madhya Pradesh which was second in terms of number of accidents is in 6th place when it comes to fatalities, followed by Andhra Pradesh, Gujarat, Telangana and West Bengal. A total of 4,80,625 accident took place in 2016 which resulted in the death of over 1 lakh 50 thousand people and seriously injuring nearly 5 lakh people (4,94,624). While the total number of accidents went down by 4.1%, fatality rate increased by 3.2 %. The shocking part was that 46.3% of the people killed were young, in the age group of 18-35 years. Driver’s fault was the main reason reported for 84 % of the accidents, 80.3% of the deaths and 83.9% of the injuries.